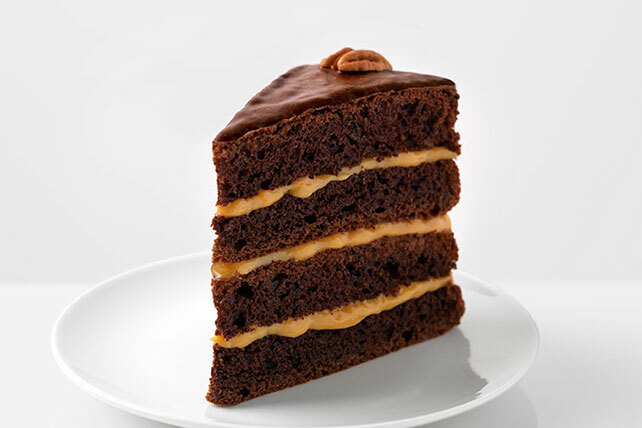 You, too, can build a towering cake made with layer after layer of chocolate and caramel lusciousness. Watch the video to see how it's done. Prepare cake batter and bake as directed on package for 2 (9-inch) round layers, adding dry chocolate pudding mix to the cake mix before mixing with liquid ingredients. Cool cakes in pans 10 min. ; invert onto wire racks. Remove pans. Cool cakes completely. Meanwhile, microwave caramels and milk in microwaveable bowl on HIGH 2 min. ; stir. Microwave 2 min. or until caramels are completely melted, stirring after each minute. Add dry vanilla pudding mix; whisk 2 min. Cool 15 min. Gently stir in 1-1/2 cups COOL WHIP. Refrigerate 20 min. or until chilled. Cut cakes horizontally in half; stack on plate, spreading 1/3 of the caramel mixture between each layer. Microwave remaining COOL WHIP and chocolate in microwaveable bowl 2 min. or until blended, stirring after each minute. Cool 10 min. Spread over torte, allowing excess glaze to drip down side. Sprinkle with nuts. Sweets can fit into a balanced diet but remember to keep tabs on portions. Omit chocolate pudding. Prepare using a yellow cake mix and 2 pkg. (3.4 oz. each) JELL-O Vanilla Flavor Instant Pudding.